Can you confirm these amateur observations of Altiphylax stoliczkai? boehmei: NE Pakistan (Ladakh Skardu), India; Type locality: Skardu/Karakorum, Ladak, NE Pakistan. Comment Distribution: Not in Pakistan (KHAN & RÖSLER 1999; KHAN, pers. comm.). But Mesodactylus yarkandensis occurs in Pakistan (KHAN 2003). Synonymy: Gymnodactylus walli has been considered as a synonym of C. stoliczkai. Cyrtodactylus yarkandensis ANDERSON 1872 (fide SMITH 1935) has been removed from the synonymy of A. stoliczkai and then resynonymized by DAS et al. 2017. Synonymy: Recent authors consider Alsophylax boehmei as a member of the Cyrtodactylus stoliczkai complex (see also SZCZERBAK & GOLUBEV, 1996) or identical to Cyrtopodion scabrum (KHAN, GOLUBEV, pers. comm.). AUFFENBERG et al. 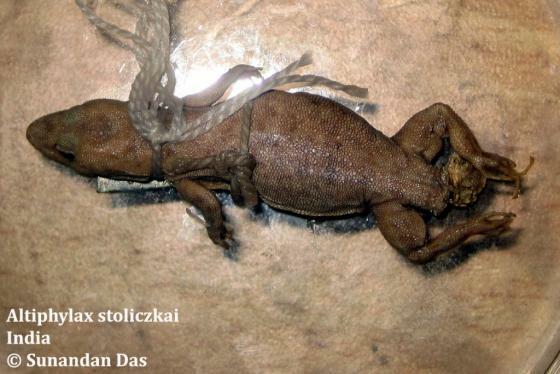 (2004) synonymized A. boehmei with Cyrtodactylus (Cyrtopodion) stoliczkai. 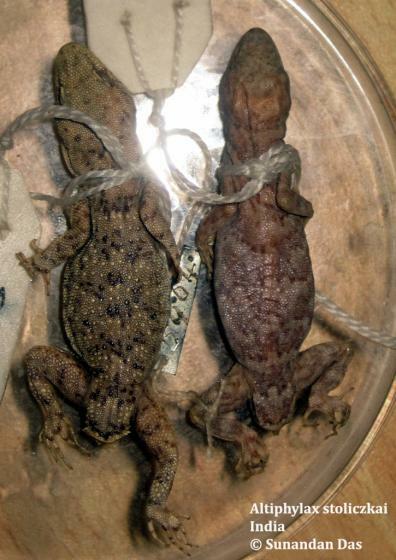 Note that the “diagnoses” for C. (Altigekko) stoliczkai and Tenuidactylus (Altigekko) baturensis in KHAN (2006) are essentially identical; KHAN also does not give a proper diagnosis for Altigekko (with comparisons to other genera), so we do not recognize this genus for the time being. Cyrtopodion stoliczkai was confirmed to be a distinct species restricted to extreme northeastern Pakistan and adjacent Ladakh region (Auffenberg et al. 2004), and is immediately separable from C. walli by a number of characters, i.e. character 8 = number of scales between the postmentals and cloaca, character 11 = number of whorls on anterior one-third of tail, character 22 = scales on top of head [AUFFENBERG et al. 2010]. Etymology Named after Wolfgang Böhme, German herpetologist.